I'm Here. I'm Queer. What the Hell do I read? 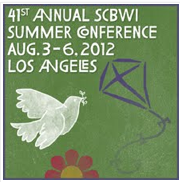 : #LA12SCBWI - Day One! FIVE keynotes, including Arthur A. Levine's "Timeless." His books are. Can't wait to hear it, and from Tony DiTerlizzi, Sara Shepard, Patricia Maclachlan and Dan Gutman! And of course, the LGBTQ Q&A session I'll be moderating (with Arthur A. Levine, Natalie Lakosil and Sonya Sones) from 7:30-8:30pm in the Westwood Room.